Virtual interactions are great but we like human contact even more! Let's connect when we come to an event near you. Join us in Paris for the second edition of our annual conference, which brings the leaders of Enterprise AI together to share how they take the plunge into the data-driven era of Intelligent Business. Join us in New York for the second edition of our annual conference, which brings the leaders of Enterprise AI together to share how they take the plunge into the data-driven era of Intelligent Business. Don't miss talks by leaders from Google, Facebook, Tesla, Uber and More! Use this special code to save 18%! EGG conference comes to Paris! Come engage with data leaders from across industries to discover how they’re working to scale their operations and solve ever more complex problems. Join us to discuss tools for AI/ML with Serkan Piantino, CEO and Founder of Spell (infrastructure for AI and Deep Learning), and former Director of Engineering at Facebook AI Research! Scott Breitenother, VP of Data and Analytics at Casper, talks about how to define your relationship with the business so there is less firefighting and more data science. We're exploring causality in data science with speakers Jed Dougherty of Dataiku and renowned NYU Professor Bud Mishra! Join us for two talks about NLP for language translation, comprehension, & generation with Alex Wolf, Data Scientist at Dataiku, and Nasrin Mostafazadeh, Senior AI Research Scientist at Elemental Cognition. We're partnering with ACM NY for a talk opening up the black box of the on-demand economy by Ming Yin, Postdoctoral Researcher at Microsoft Research. Join us in New York to explore the intersection of quantum computing and machine learning with Max Henderson, Senior Data Scientist at QxBranch. Another exciting evening of data science in San Francisco with Luis Bitencourt-Emilio, Principal Director of Engineering at Reddit, and Ulysses David, Customer Success Manager at Dataiku! Join us for an enriching evening of data science at George Washington University. We'll explore the intersection of quantum computing and machine learning with John Kelly, Director of Analytics at QxBranch. We're excited to bring together San Diego's data community. Sign up for top-notch presentations on how to foster a data-driven culture by Page Piccinini, Senior Data Scientist at Classy, and Sean Hanlon, CSM at Dataiku. Dataiku's Lead Data Scientist Jed Dougherty is invited to talk data science by Columbia Data Science Society! He will share a project analyzing one of the richest national datasets on eviction in Kansas City, Missouri. Join us for a deep dive into how data science creates impact! We'll kick things off with a walk-through of a predictive analytics project, before exploring how data science can drive impact at a global level. Join us for two talks on open data and how it can help build better cities with Constantine Kontokosta, Assistant Professor of Urban Informatics at NYU CUSP, and Jed Dougherty, Lead Data Scientist at Dataiku. Yael Elmatad, Lead Data Scientist at GIPHY, will explain how she and her team develop their search engine to remain at the top of the social media frenzy. Yashas Vaidya (Solutions Architect, Dataiku) and Arsen Vladimirskiy (Principal Azure Cloud Architect, Microsoft) will walk you through the entire data science process for predicting a customer’s next purchase. We’re bridging the gap between machine learning and economics in this meetup with Nicolas Woloszko, Junior Economist at the OECD! Stuart Lynn, Head of Research and Data at CARTO will discuss how location can add an extra dimension to data science. Jerry Talton, Senior Engineering Manager at Slack, will sketch the data-driven directions that their Search, Learning and Intelligence team is exploring to build the business operating system of the future. Established tech giants and startups alike have been clamoring for a seat at the table in the banking and insurance industries. Adapting to this new reality means using the tools of the newcomers’ trade - data science, big data, and algorithms - and supplementing those technologies with the unique assets and strengths of traditional banking and insurance companies. This Meet-up will help you learn a bit more about this thanks to Expert Insights. The data team behind the career platform built a recommender system via classification, and Chris Ryan (Senior Data Scientist and Tech Lead) will share their experiment and discuss how to choose the right tool for the right product feature & dataset. Join us for Dataiku's 10th Databreakfast on "Banking, Marketing and Predictive Analytics: New Tools for for An Enhanced user Experience" with BPCE Head of CRM, Catherine Reljic, and Avisia Manager, Elie N'Kaoua. Tarush Aggarwal, Director of Data Engineering, will tell us how he and his team at WeWork moved from a traditional on-premises data warehouse architecture to a cutting edge framework leveraging the relational data warehouse Amazon Redshift. Jeremy Salfen, Director of Data at Kickstarter, will explain how his team built its recommender system from scratch and give attendees tips and tricks to help them create their own. Join us at General Assembly NYC to explore the data scientist's toolkit! Guilherme de Oliveira, Data Scientist at Dataiku, will provide you with a deep dive into the data, questions, and tools that analysts and scientists work with. Vincent de Stoecklin, Head of Partnerships at Dataiku and Leo Yorke, Senior Analyst at Keyrus will look into the practical steps to executing Churn Prediction. In this meetup, we'll discuss how to predict employee turnover and how data and drivers can determine employee happiness with Simon Rakosi, Co-Founder at Butterfly.ai and Guilherme de Oliveira, Data Scientist at Dataiku. Kenny Ning, Senior Data Scientist at Spotify, will explain what is "Content Data and Analytics" in the context of music, media, and entertainment and how it is driving the new wave of strategic thinking. Join our upcoming webinar on July 19 at 11:30 am BST. We'll discuss Predicting Customer Churn with Open Source Technologies with our partner Keyrus. Join us for Dataiku's 9th Databreakfast on "Technology, Architecture, Set Up: 3 challenges for a successful data project" with OVH Data Architect, Magalie Barreau-Combeau, and Quantmetry Manager, Emmanuel Manceau. Join us for Dataiku's 8th Databreakfast on churn detection with UGC CIO, Laurent Kobrin, and Equancy partner, Hervé Mignot. 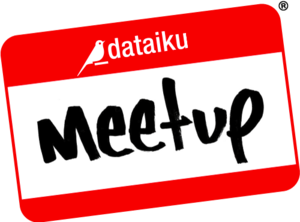 Dataiku is Organising The Third edition of "DataBreakfast"
Dataiku is organising the second edition of "DataBreakfast"
For our 10th User Group in Paris, we'll welcome our users in our brand new offices! Come join us for our 9th User group with French Unicorn (and our BFF) Blablacar! Sign up now and join this training! For DUG#8 we're inviting users to join our team to discuss and work on ways to increase user loyalty with predictive analytics together. For DUG#7 we're inviting users to join our team for an evening and develop DSS plugins together. Two of our data scientists, Matt and Leo, will be presenting a predictive model to help anticipate demand in Red Cross food distribution centers. Sign up now and join our next Free Training! Dataiku was exhibiting at this event about Predictives APIs and Apps that took place in Paris. Dataiku was exhibiting at the recruiting Remix Job event that took place in Paris. Smart City and Mobility Innovations, San Francisco. Dataiku was exhibiting at this Big Data event that took place in London. Dataiku welcomed many users for the 3rd Paris DUG meetup. Dataiku is exhibiting at Innovate Finance in London. Dataiku was exhibiting at Rude Baguette's recruiting event which took place in Paris. Dataiku was at the major French event about the Big Data ecosystem. Dataiku was exhibiting at this Big Data event that took place in San Jose. Dataiku was exhibiting at this Big Data event that took place in Barcelona. Dataiku was exhibiting at Papis.io in Barcelona. During the event, Florian Douetteau gave two talks. Dataiku was exhibiting at the major Big Data event that took place in New York. Dataiku was a partner at the Systematic Convention 2014 in Paris. Dataiku was at the Devoxx Paris 2014 conference. Florian Douetteau gave a talk about Lambda Architectures.